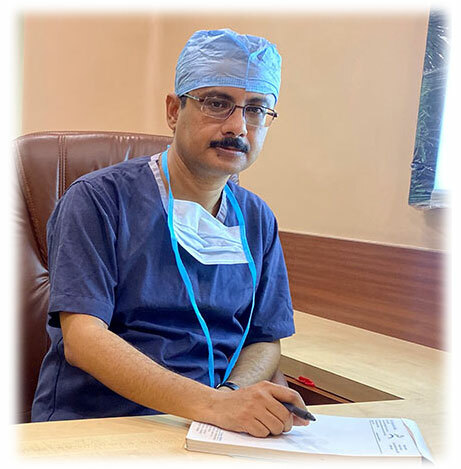 Dr.Kalyan Guha is a senior reputed orthopaedic surgeon based in Kolkata. He has experience of more than 14 years in the field of orthopaedic surgery. He is an experienced specialist in Primary and Revision Joint Replacement Surgeries involving hip, knee and shoulder, Arthroscopic surgeries involving knee, shoulder and elbow, Pelviacetabular surgery and complex trauma surgeries. He earned his medical degree (MBBS) from Medical College, Kolkata, the most prestigious medical college in India and Asia. He has done his master’s in Orthopaedic Surgery (MS) from NRS Medical College, Kolkata under Calcutta University. His passion for Joint replacement surgery and Arthroscopic surgery has taken him through training in various hospitals in India, Europe and North America. To enhance his knowledge and to fine tune his surgical skills in hip and knee joint replacement he took training at Sunnybrook Health Services Centre in Toronto, Canada. He was trained extensively in shoulder arthroscopy and arthroplasty by an internationally famous orthopaedic surgeon Dr. Jaap Williems in Onze Lieve Vrouwe Gasthuis (OLVG) Hospital, Amsterdam, The Netherland ( ISAKOS Training Centre). Currently, Dr. Guha one of a young best reputed orthopedic surgeon based in Kolkata, is the life member of various medical associations like Indian Medical Council (IMA), Indian Orthopaedic Association (IOA), Indian Arthroscopic Society (IAS), West Bengal Orthopaedic Association(WBOA), West Bengal Arthroplasty Society (WBAS) and also International body like AO. He is actively participates in different national and international conferences and also takes part in various teaching courses to train younger orthopedic surgeons.